While this quote is not specifically about music, I found it appropriate for two reasons: 1) Today is Martin Luther King, Jr. Day and 2) every musician who has ever truly been successful has done exactly what this quote says. From the moment they formed their first band; from the moment they first stepped out on a stage to play; from the moment they went on their first tour, none of them ever actually knew how it would turn out. But those who continued to take that next step, continued to climb that staircase, have had the chance and ability to make their dream come true. Finally, while I have applied this quote to music, since that is my forte, it could also be applied to any life goal or dream. Please, everyone keep climbing that staircase and make your own dreams come true. 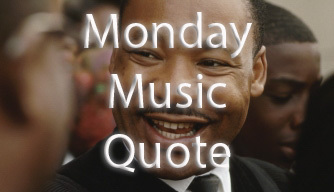 This entry was posted in Monday Music Quotes and tagged Martin Luther King Jr., MLK, Monday, Monday Music Quote, Music, Quote.